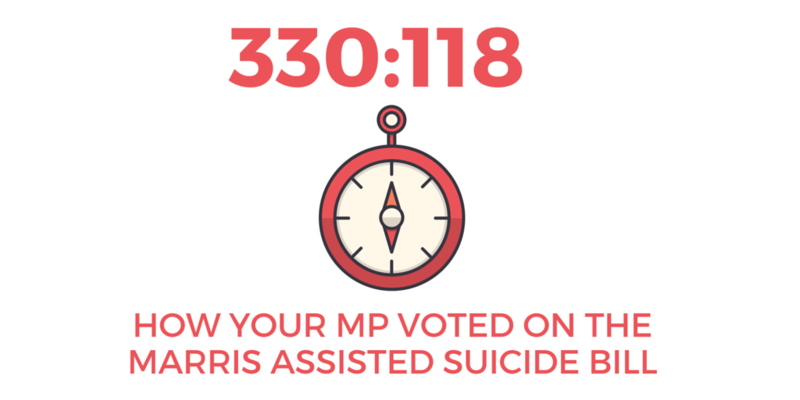 330:118 - How your MP voted on the Marris assisted suicide Bill - No To Assisted Suicide - UK's campaign to stop assisted suicide. 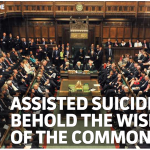 Out of 650 MPs, a total of 448 took part in the free vote on assisted dying. Of these 448, 330 opposed the Bill and 118 supported the Bill. It was a free vote, which meant they could support either side or none, without being told to toe a party line. To quickly find your MP use the find function in your browser (PC: CNTRL+F, MAC: CMND+F). If your MP opposed the Marris assisted suicide Bill, we encourage you to send a quick email to them to thank them for voting against it. Please also bear in mind how your MP voted when it comes to voting in the next general election. Debbie Abrahams (Oldham East & Saddleworth), Rushanara Ali (Bethnal Green & Bow), David Anderson (Blaydon), Jon Ashworth (Leicester South), Tom Blenkinsop (Middlesbrough South & Cleveland East), Lyn Brown (West Ham), Chris Bryant (Rhondda), Richard Burgon (Leeds East), Dawn Butler (Brent Central), Alan Campbell (Tynemouth), Ann Clwyd (Cynon Valley), Rosie Cooper (Lancashire West), Neil Coyle (Bermondsey & Old Southwark), David Crausby (Bolton North East), Mary Creagh (Wakefield), Jon Cruddas (Dagenham & Rainham), Judith Cummins (Bradford South), Jim Cunningham (Coventry South), Stephen Doughty (Cardiff South & Penarth), Jim Dowd (Lewisham West & Penge), Peter Dowd (Bootle), Clive Efford (Eltham), Julie Elliott (Sunderland Central), Bill Esterson (Sefton Central), Chris Evans (Islwyn), Frank Field (Birkenhead), Rob Flello (Stoke-on-Trent South), Colleen Fletcher (Coventry North East), Barry Gardiner (Brent North), Pat Glass (Durham North West), Mary Glindon (Tyneside North), Margaret Greenwood (Wirral West), Nia Griffith (Llanelli), David Hanson (Delyn), Helen Hayes (Dulwich & West Norwood), Sue Hayman (Workington), Stephen Hepburn (Jarrow), Meg Hillier (Hackney South & Shoreditch), Sharon Hodgson (Washington & Sunderland West), Kate Hoey (Vauxhall), Imran Hussain (Bradford East), Alan Johnson (Hull West & Hessle), Gerald Jones (Merthyr Tydfil & Rhymney), Helen Jones (Warrington North), Susan Elan Jones (Clwyd South), Mike Kane (Wythenshawe & Sale East), Sir Gerald Kaufman (Manchester Gorton), Barbara Keeley (Worsley & Eccles South), David Lammy (Tottenham), Emma Lewell-Buck (South Shields), Ivan Lewis (Bury South), Ian Lucas (Wrexham), Rebecca Long-Bailey (Salford), Steve McCabe (Birmingham Selly Oak), Siobhain McDonagh (Mitcham & Morden), Andy McDonald (Middlesbrough), Conor McGinn (St Helens North), Liz McInnes (Heywood & Middleton), Catherine McKinnell (Newcastle upon Tyne North), Justin Madders (Ellesmere Port & Neston), Shabana Mahmood (Birmingham Ladywood), Seema Malhotra (Feltham & Heston), Gordon Marsden (Blackpool South), Rachael Maskell (York Central), Chris Matheson (Chester, City of), Grahame Morris (Easington), Albert Owen (Ynys Mon), Teresa Pearce (Erith & Thamesmead), Toby Perkins (Chesterfield), Bridget Phillipson (Houghton & Sunderland South), Stephen Pound (Ealing North), Yasmin Qureshi (Bolton South East), Kate Osamor (Edmonton), Angela Rayner (Ashton Under Lyne), Jonathan Reynolds (Stalybridge & Hyde), Marie Rimmer (St Helens South & Whiston), Virendra Sharma (Ealing Southall), Barry Sheerman(Huddersfield), Dennis Skinner (Bolsover), Gavin Shuker (Luton South), Andrew Smith (Oxford East), John Spellar (Warley), Graham Stringer (Blackley & Broughton), Gisela Stuart (Birmingham Edgbaston), Mark Tami (Alyn & Deeside), Nick Thomas-Symonds (Torfaen), Stephen Timms (East Ham), Derek Twigg (Halton), Keith Vaz (Leicester East), Valerie Vaz (Walsall South) and John Woodcock (Barrow & Furness). Richard Arkless (Dumfries & Galloway),Ian Blackford (Ross, Skye & Lochaber), Dr Lisa Cameron (East Kilbride, Strathaven & Lesmahagow), Marion Fellows (Motherwell & Wishaw), Margaret Ferrier (Rutherglen & Hamilton West), Patrick Grady (Glasgow North), Carol Monaghan (Glasgow North West), Gavin Newlands (Paisley & Renfrewshire North), Brendan O’Hara (Argyll & Bute), Christopher Stephens (Glasgow South West) and Dr Philippa Whitford (Ayrshire Central). Nick Clegg (Sheffield Hallam), John Pugh (Southport) and Mark Williams (Ceredigion). Gregory Campbell (Londonderry East), Nigel Dodds (Belfast North), Jeffrey Donaldson (Lagan Valley), Ian Paisley (Antrim North), Gavin Robinson (Belfast East), Jim Shannon (Strangford), David Simpson (Upper Bann) and Sammy Wilson (Antrim East). Lady Syvia Hermon (Down North). Labour’s Rupa Huq (Ealing Central and Acton) is excluded after voting in both lobbies. Lucy Allan (Telford), Gavin Barwell (Croydon Central), Andrew Bingham (High Peak), Crispin Blunt (Reigate), Greg Clark (Tunbridge Wells), Tracey Crouch (Chatham and Aylesford), Lucy Frazer (Cambridgeshire South East), Nick Gibb (Bognor Regis & Littlehampton), Zac Goldsmith (Richmond Park), Peter Heaton-Jones (Devon North), Kevin Hollinrake (Thirsk & Malton), Robert Jenrick (Newark), Joseph Johnson (Orpington), Kit Malthouse (Hampshire North West), Scott Mann (Cornwall North), Tania Mathias (Twickenham), Huw Merriman (Bexhill & Battle), Nigel Mills (Amber Valley), Andrew Mitchell (Sutton Coldfield), Guy Opperman (Hexham), Claire Perry (Devizes), Chris Philp (Croydon South), Paul Scully (Sutton & Cheam), Chloe Smith (Norwich North), Anna Soubry (Broxtowe), Mel Stride (Devon Central) and Matt Warman (Boston & Skegness). Graham Allen (Nottingham North), Adrian Bailey (West Bromwich West), Kevin Barron (Rother Valley), Hilary Benn (Leeds Central), Clive Betts (Sheffield South East), Paul Blomfield (Sheffield Central), Nick Brown (Newcastle upon Tyne East), Karen Buck (Westminster North), Richard Burden (Birmingham Northfield), Ruth Cadbury (Brentford & Isleworth), Sarah Champion (Rotherham), Ann Coffey (Stockport), Jo Cox (Batley & Spen), Stella Creasy (Walthamstow), Wayne David (Caerphilly), Geraint Davies (Swansea West), Angela Eagle (Wallasey), Maria Eagle (Garston & Halewood), Jim Fitzpatrick (Poplar & Limehouse), Caroline Flint (Don Valley), Paul Flynn (Newport West), Vicky Foxcroft (Lewisham Deptford), Roger Godsiff (Birmingham Hall Green), Helen Goodman (Bishop Auckland), Kate Green (Stretford & Urmston), Lilian Greenwood (Nottingham South), Louise Haigh (Sheffield Heeley), Harriet Harman (Camberwell & Peckham), Carolyn Harris (Swansea East), Margaret Hodge (Barking), Kelvin Hopkins (Luton North), George Howarth (Knowsley), Liz Kendall (Leicester West), Stephen Kinnock (Aberavon), Dr Peter Kyle (Hove), Clive Lewis (Norwich South), Holly Lynch (Halifax), Kerry McCarthy (Bristol East), Pat McFadden (Wolverhampton South East), John Mann (Bassetlaw), Rob Marris (Wolverhampton South West), Ed Miliband (Doncaster North), Madeleine Moon (Bridgend), Ian Murray (Edinburgh South), Melanie Onn (Great Grimsby), Matthew Pennycook (Greenwich & Woolwich), Jess Phillips (Birmingham Yardley), Lucy Powell (Manchester Central) Jamie Reed (Copeland), Christina Rees (Neath), Emma Reynolds (Wolverhampton North East), Geoffrey Robinson (Coventry North West), Paula Sherriff (Dewsbury), Tulip Siddiq (Hampstead & Kilburn), Andy Slaughter (Hammersmith), Cat Smith (Lancaster & Fleetwood), Jeff Smith (Manchester Withington), Owen Smith (Pontypridd), Karin Smyth (Bristol South), Keir Starmer (Holborn & St Pancras), Jo Stevens (Cardiff Central), Wes Streeting (Ilford North), Anna Turley (Redcar), Karl Turner (Hull East), Stephen Twigg (Liverpool West Derby), Chuka Umunna (Streatham), Catherine West (Hornsey & Wood Green), Phil Wilson (Sedgefield), David Winnick (Walsall North), Rosie Winterton (Doncaster Central), Iain Wright (Hartlepool) and Daniel Zeichner (Cambridge). Kirsty Blackman (Aberdeen North), Alan Brown (Kilmarnock & Loudoun), Ronnie Cowan (Inverclyde), Stuart Donaldson (Aberdeenshire West & Kincardine), George Kerevan (East Lothian), Calum Kerr (Berwickshire, Roxburgh & Selkirk), Chris Law (Dundee West), Callum McCaig (Aberdeen South), Stewart McDonald (Glasgow South), Dr Paul Monaghan (Caithness, Sutherland & Easter Ross), Roger Mullin (Kirkcaldy & Cowdenbeath), John Nicolson (Dunbartonshire East), Tommy Sheppard (Edinburgh East) and Corri Wilson (Ayr, Carrick & Cumnock).